Can anyone tell me why this is the only Phazon damage trigger in Phazon Mining Tunnel ? I did make sure to unhide all objects btw. and this trigger doesn't cover everything alone obviously. 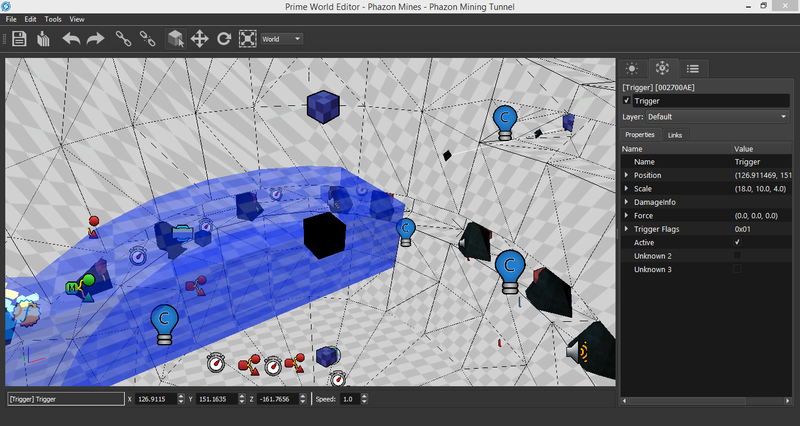 Phazon damage is mainly taken from a setting on the collision, not from triggers. The trigger you are looking at activates the double damage in the tunnel. I guess they really didn't want people to do early newborn ... welp too bad. Thanks, I didn't know about that. Why did Retro implemented 2 ways to deal phazon damage >_> I guess they really didn't want people to do early newborn ... welp too bad. Is there any way to load up a room by the MREA file? I'm trying to see how the SpecialFunctions in Sun Tower change the layer in another room, but all I have is the room ID. Layers use an internal area ID, not the MREA ID, and PWE doesn't display it anywhere on the UI right now unfortunately. The best you can really do atm is open up the MLVL in a hex editor and look for it (it's immediately after the room's MREA ID so it's not very hard to find). Joy! Just needed to update my driver's. Works now. Question: is there a way to see the load box? Or whatever it's called. The thing you climb when aether jumping. Happiness! A release! . .. ... Sadness! My graphics card isn't good enough . .. ... Joy! Just needed to update my driver's. Works now. Question: is there a way to see the load box? Or whatever it's called. The thing you climb when aether jumping. Congrats on the release! Not currently. It's just the bounding box of the collision geometry though so you can just turn on the collision view and see how far out the collision extends to kinda approximate it. Is there a way to change room connections in echoes? Not currently, that requires editing the MLVL. You can, however, fake it by using world teleports. Not currently, that requires editing the MLVL. You can, however, fake it by using world teleports. -elevators and other world teleporters seem to work just fine! I am a bit curious to know why pirate troopers can attack multiple players... What do you think, Parax? I decided to do some experiments with Echoes' multiplayer mode the past few days I threw Agon Wastes into the 6th pak and replaced Sidehopper Station with it to see how the game reacted here's some things I experienced during the experiment and felt like I needed to share: -the game will unload rooms with players inside if someone (usually player 1) decides to run through a door alone best to stay within the same room unless you need to break the game -spawn points in the previous room will still function, but don't normally make the room visible again -alot of enemies just ignore other players and chase player 1 around some don't even damage the other players -many of the cutscenes, namely ones with Samus actors, tend to overlap the other player's screen(s) -elevators and other world teleporters seem to work just fine! probably don't even have to replace any multiplayer maps, I'll just toss a world teleporter somewhere later -Sandiggers tend to crash the game for whatever reason and cause some pretty awful graphical glitches, possibly due to the entities they trigger -some larger rooms also seem to crash the game if players don't wait a bit before opening the door -Space Pirate troops can target other players and attack them under the right conditions I think I may have even seen one change target after getting smacked in the face by a boost ball -scan visor is completely non-functional, I had to replace many scan objects with damageable triggers -dark world safe zones are invisible and shot activated ones seem to have crashed the game if I remember correctly that's about all I got to say for the time being, but I am at least a little excited that space pirates could have some use in future multiplayer mods I am a bit curious to know why pirate troopers can attack multiple players... What do you think, Parax? no clue. A lot of stuff was cut from Echoes multiplayer, so it's entirely possible they were originally intended to be used in multiplayer somehow. For future reference, you didn't need to move Agon Wastes to a different pak; just open the main menu world in FrontEnd.pak and edit the WorldTeleporter that loads the multiplayer maps. no clue. A lot of stuff was cut from Echoes multiplayer, so it's entirely possible they were originally intended to be used in multiplayer somehow. For future reference, you didn't need to move Agon Wastes to a different pak; just open the main menu world in FrontEnd.pak and edit the WorldTeleporter that loads the multiplayer maps. Edit: do you think it could be connected to every multiplayer stage having a StreamedAduio with the pirate battle theme? Oh! very neat! thanks for the tip Parax ;P Edit: do you think it could be connected to every multiplayer stage having a StreamedAduio with the pirate battle theme? I'm pretty sure that's just because it's one of the music tracks you can play during multiplayer? there's an unused one that is connected to the SequenceTimers for "One Kill Remaining!" and "One Minute Remaining!" events that plays "pirates_kyu-3-32.dsp". It doesn't play even though it's linked to play during those events, probably due to it being cutoff by the 2 StreamedAudios playing "multi-defbgm-speed-loop32.dsp"
so how do i change a missile door color and have the any beam door stay that color? You can't. The properties of the door after the missile lock has been destroyed are hardcoded. Regarding Pirates in multiplayer, it's worth noting that the MP2 demo disc contains a first-person model of a Pirate arm. There was likely going to be some multiplayer mode where you could play as a Pirate. There's also a ball transition model for a GF Trooper I believe, so yeah my guess is originally the multiplayer characters were going to be Samus + Pirate + GF Trooper + something else, instead of four Samuses. it would be interesting how mp2 would have turned out if they had more time. seems almost all the problems and cut things came from rushing development. i miss the Prime controls when playing Echoes. So much more fluid. More abusable too. I do like the easier Aether Jumping in Echoes though. I'd love to play Echoes with Prime jumps or its partial boosting. Or Prime with Echoes easier Aether Jumps. Too bad PWE can't do those sorts of things. I'm assuming. It is a world editor after all. 1.) Is there currently a way to change the vulnerability of a damageable trigger based on having picking up a specific item? For example, having an ice door be vulnerable only to ice UNLESS you've picked up ice beam, at which point said door becomes vulnerable to both ice AND bombs. Is this something that would require a SpecialFunction to add/change layers or is there another way? 2.) What's the deal with Unused Weapon 1 2 and 3? 4.) What am I missing out on with these not loaded? "Unsupported format: unable to load SAVW 2D520903"
"Unsupported format: unable to load MAPW CBCE8E24"
5.) In Echoes, is the "Run into IL Portal Room" scene tied to the room transition? i miss the Prime controls when playing Echoes. So much more fluid. More abusable too. I do like the easier Aether Jumping in Echoes though. I'd love to play Echoes with Prime jumps or its partial boosting. Or Prime with Echoes easier Aether Jumps. Too bad PWE can't do those sorts of things. I'm assuming. It is a world editor after all. Anyway, I have a few questions: 1.) Is there currently a way to change the vulnerability of a damageable trigger based on having picking up a specific item? For example, having an ice door be vulnerable only to ice UNLESS you've picked up ice beam, at which point said door becomes vulnerable to both ice AND bombs. Is this something that would require a SpecialFunction to add/change layers or is there another way? 2.) What's the deal with Unused Weapon 1 2 and 3? 3.) Amanda? Irving? 4.) What am I missing out on with these not loaded? "Unsupported format: unable to load SAVW 2D520903" "Unsupported format: unable to load MAPW CBCE8E24" 5.) In Echoes, is the "Run into IL Portal Room" scene tied to the room transition? Kinda. You would need two DamageableTriggers set up, one with the first set of vulnerabilities and one with the second set, and swap them out when the player picks up Ice Beam. There's two main ways to accomplish that; you can either make Ice Beam trigger a layer swap that disables the layer with the first trigger and enables the layer with the second trigger. This isn't really simple to do in the current build though because PWE doesn't allow editing layers. The second method (this is the better one) is to make a ConditionalRelay in the room that checks for Ice Beam, and if the check succeeds deactivates the first trigger and activates the second one. They're weapon slots that aren't used. Not much to say about it. One of them is probably "Cold", since MP2/3 have weapons called that, and MP1 does have the corresponding Hot. The layers in Central Dynamo? Those refer to Amanda Rubright and Irving Mah, two of the designers who worked on the game listed in the credits. Don't worry about that, they just aren't supported yet. SAVW controls how stuff writes to the save file (Memory Relays and etc), MAPW controls the world map. Sorta, there's a SequenceTimer in the room that controls the cinematic that's set up to start as soon as it loads. [quote="Odylg"]1.) Is there currently a way to change the vulnerability of a damageable trigger based on having picking up a specific item? For example, having an ice door be vulnerable only to ice UNLESS you've picked up ice beam, at which point said door becomes vulnerable to both ice AND bombs. Is this something that would require a SpecialFunction to add/change layers or is there another way? [/quote] Kinda. You would need two DamageableTriggers set up, one with the first set of vulnerabilities and one with the second set, and swap them out when the player picks up Ice Beam. There's two main ways to accomplish that; you can either make Ice Beam trigger a layer swap that disables the layer with the first trigger and enables the layer with the second trigger. This isn't really simple to do in the current build though because PWE doesn't allow editing layers. The second method (this is the better one) is to make a ConditionalRelay in the room that checks for Ice Beam, and if the check succeeds deactivates the first trigger and activates the second one. [quote]2.) What's the deal with Unused Weapon 1 2 and 3? [/quote] They're weapon slots that aren't used. Not much to say about it. One of them is probably "Cold", since MP2/3 have weapons called that, and MP1 does have the corresponding Hot. [quote]3.) Amanda? Irving? [/quote] The layers in Central Dynamo? Those refer to Amanda Rubright and Irving Mah, two of the designers who worked on the game listed in the credits. [quote]4.) What am I missing out on with these not loaded? "Unsupported format: unable to load SAVW 2D520903" "Unsupported format: unable to load MAPW CBCE8E24"[/quote] Don't worry about that, they just aren't supported yet. SAVW controls how stuff writes to the save file (Memory Relays and etc), MAPW controls the world map. [quote]5.) In Echoes, is the "Run into IL Portal Room" scene tied to the room transition? [/quote] Sorta, there's a SequenceTimer in the room that controls the cinematic that's set up to start as soon as it loads.